The Candida antigen test checks for Candida albicans antigen in the blood. What is the Candida antigen test? The Candida antigen blood test measures the Candida albicans antigen blood level. Why is the Candida antigen test important? The Candida antigen test helps check for a widespread Candida infection in the body. This Candida Antigen Test is a blood test. The Candida antigen test, sometimes known as a Candida ag blood test and Candida antigen lab test, checks for Candida antigen in the blood. The Candida antigen test is helpful for detecting Candida albicans that has disseminated, or spread, throughout the body. While some Candida normally exists in the gastrointestinal system and other places in the body, a Candida overgrowth can be problematic. So-called candidiasis, a disseminated infection by this fungus and can cause a wide range of symptoms, some of which could be life-threatening. Increasing attention has been paid to the role of a Candida infection in people with milder symptoms. In healthy individuals, a complex ecosystem exists in the body in which friendly bacteria such as Lactobacillus acidophilus keep colonies of Candida under control. When friendly bacteria are inadvertently wiped out, Candida can growth and produce chemicals that can affect the body adversely. Not only can some of these chemicals cause symptoms of lethargy and brain fog, but some people believe that they can cause ongoing damage to the immune system and the gut. Depending on the person, excessive use of antibiotics, steroids or birth control pills as well as eating process foods may contribute to excessive Candida growth which can often be detected using the Candida antigen blood test. To get a Candida antigen test near you, simply order online and get tested at your local Quest lab. 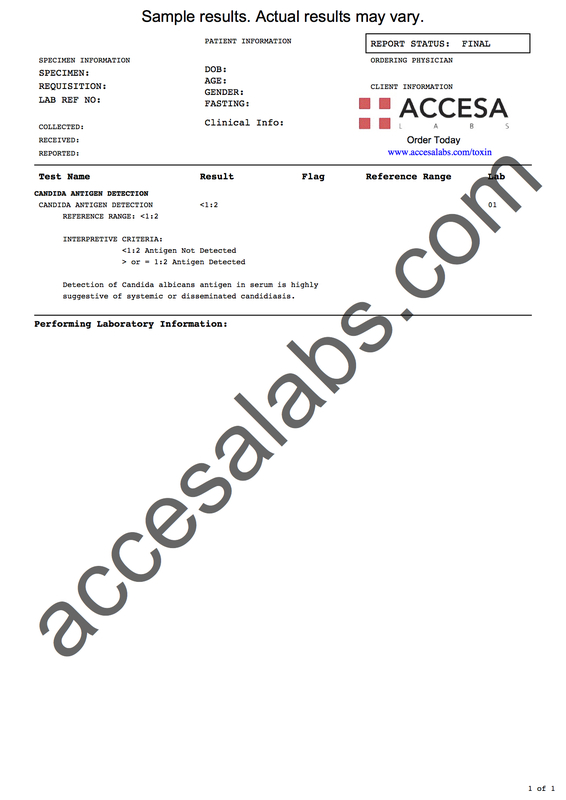 Once your Candida antigen lab results are ready, they will be available for download. As can be seen on the Candida antigen sample lab report above, the Candida antigen results will be reported as a numerical value which can be compared against the reference range provided by the lab. A positive Candida antigen test suggests that one has a disseminated Candida albicans infection in the body. For people interested in a Candida antibody test, check out the Candida IgG antibody test or the more comprehensive Candida antibody panel. Candida Antigen Test at Guaranteed Prices.